If you call 69-year-old Tom Weber a “geezer,” the only response you’ll get out of him is a smile. Well, unless you’re a teammate of Weber’s on The Fuller Center Bicycle Adventure — in which case you’re way more likely to get a good-natured jab right back at you. Weber calls himself a “geezer,” even on his personal blog, which he titled “Geezer Log.” Perhaps if Weber weren’t more active than most 19-year-olds, he wouldn’t throw the term “geezer” around so lightly. But he is, and he does. Weber joined his first-ever Bicycle Adventure last year only because he was looking for a unique challenge. He wasn’t necessarily looking to become a regular or get involved with The Fuller Center’s mission. But this year he has signed up for the Adventure’s first-ever Spring Ride, which begins Sunday in Nashville, Tenn., and continues down the scenic Natchez Trace all the way to Jackson, Miss., where it concludes on St. Patrick’s Day, March 17. And, oh by the way, he’ll also be on the Summer Adventure once again. He’d planned to complete the entire cross-country journey in 2011 but suffered a dislocated shoulder when the team’s van crashed in Idaho on the way to its start in Seattle. Still he rehabbed so quickly, more quickly than his doctor preferred, and rejoined the team in Salt Lake City and rode all the way to Washington, D.C. This summer, he’ll be doing both coasts on the Summer Ride (Maine to Key West and Seattle to San Diego). We caught up with Weber by phone as he prepared to make the trip to Music City USA for the start of the spring ride. How are you doing? Have you been gearing up for the spring ride? I am doing fabulous; I just need to be on my bike more. This weather up here in Colorado isn’t cooperating with me a whole lot right now, but it’ll work out. We’ve had more snow this year than I’ve seen in a while. I’m not a native here by any means, and I know it’s been worse. But I’m from Chicago. This is paradise. I just love it here. You went from being curious about The Fuller Center to being an avid supporter. What hooked you? Just the mission. I knew nothing about Millard (Fuller). Reading the little bit I have about him, it’s just such a fabulous story. My son has been involved in Habitat for years. It just went over my head as I was busy working and trying to survive. Then you retire and look for some adventure. And this thing pops up and I’m like, ‘Wow! That’s what these guys do!’ And you get out there and stop and help some of these people with building a home — or in our case we did a lot of rehab stuff on our ride — and it’s just pretty awesome what we do. Of course, not everyone sees retirement like you … as a time to look for adventure. That’s totally interesting, and you’re absolutely right. I’ve been active a lot in my life. But I think moving away from Chicago and our business, which our son now runs, getting away from that and into a community of 55-and-older — I call it Geezerville where I live — a lot of them sit around and play checkers and play cards and are not active, but a good majority are. We’ve got a bike club, and we just ordered jerseys for 45 people. So that’s just biking, not including tennis and other activities. That’s just some of the active lifestyles that take place here. It just keeps you involved if you want to be. You throw the term “geezer” around a lot tongue-in-cheek. Is it easier to do that when you are active and act like you’re a teenager? Exactly. I’ll even have “Geezerman” on my bicycle this year! I may not have it by the spring ride, but I’ll definitely have it by the East Coast summer ride. There must be a lot of back-and-forth kidding between you and the younger riders. Do you give it back to them as good as they give it to you? I try my best. I can’t tell you how much I enjoy being around the quality of people that rode with me and everybody that we ran into. I think I met one grouchy person the entire trip out of how many thousands that was. It’s just a fabulous adventure and a way to keep you young. I’m on Facebook and still giving it and getting it via Facebook with these kids, as well. 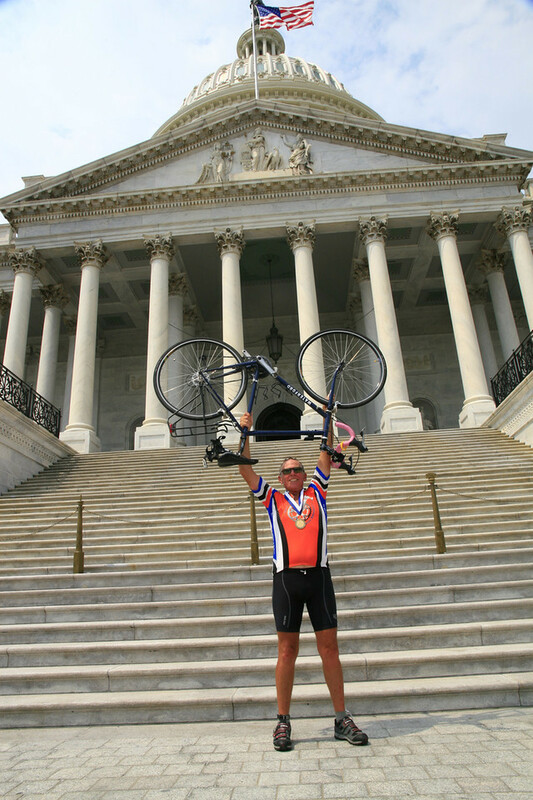 Donate to Tom Weber’s fundraising efforts through the Bicycle Adventure. View hundreds of Bicycle Adventure photos here. Follow Tom’s lead and sign up for the Summer Adventure, either or both coasts!